Located in Peterborough, New Hampshire, Millard Group, Inc., is recognized as one of the nation’s leading providers of direct marketing services. Since 1977, Millard Group has served the direct marketing industry with list management, list brokerage, and, more recently, alternative media services. 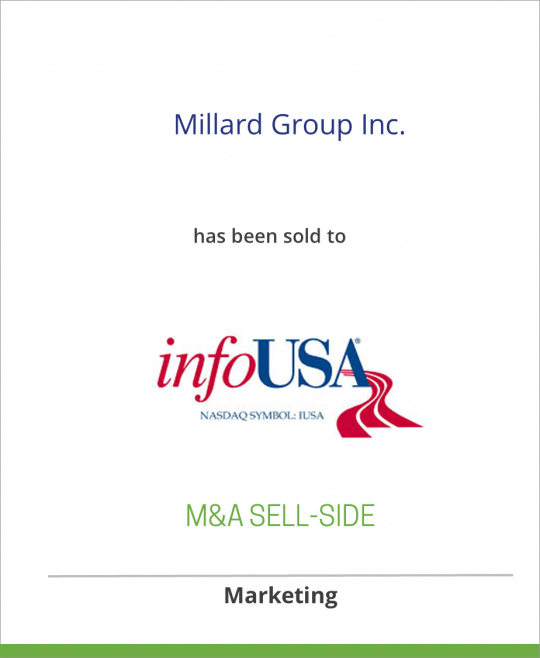 Following its sale to infoUSA, Millard Group will retain its management team and continue to operate independently. It will become part of the Donnelley Group, which includes seven other companies: Donnelley Marketing, Walter Karl, Edith Roman, Catalog Vision, Triplex, Yesmail and OneSource. For more information about Millard Group, visit: www.millard.com. infoUSA (NASDAQ:IUSA), based in Omaha, Nebraska, and founded in 1972, is the leading provider of business and consumer information products, database marketing services, data processing services and sales and marketing solutions. infoUSA has the most comprehensive data in the industry, and is the only company to own a proprietary database of 250 million consumers and 14 million businesses under one roof. The infoUSA database powers the directory services of the top Internet traffic-generating sites. Nearly 4 million customers use infoUSA’s products and services to find new customers, grow their sales, and for other direct marketing, telemarketing, customer analysis and credit reference purposes. For more information, visit: www.infoUSA.com.